FORMER TAOISEACH Bertie Ahern has claimed over €377,000 in expenses since leaving government – despite a generous pensions package and his continued allowances as a TD. Figures released by the government to Labour backbencher Anne Ferris show that Ahern has received some €366,284 to employ secretarial assistants, who help him manage duties arising from his status as a former head of government. In addition, he has claimed some €10,655 in mobile phone expenses between leaving office in mid-2008 and the end of August. The payments were made under schemes introduced under his tenure to assist former taoisigh with the management of their duties. Ahern’s payments are higher than those paid to three other former taoisigh who have been entitled to payments since the scheme began. Since 2001, when payments for assistants began, Albert Reynolds has received €250,842 to pay for secretarial assistants; the late Dr Garret FitzGerald had received €230,466; and John Bruton took €156,442 for secretarial help. 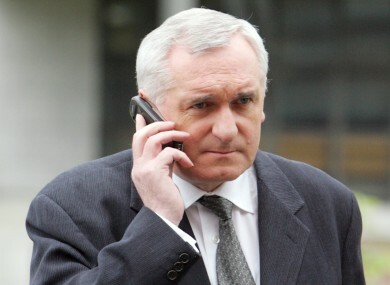 Ahern’s phone expenses are also higher than those paid to each of the three – even though those expenses were paid, from 2005, to the same three former taoisigh. Reynolds had claimed €7,234.93 in mobile phone expenses between 2005 and August 2011, while Fitzgerald had received €5,986.48 and Bruton had received €9,938.11. Charles Haughey had received €91,719.19 for secretarial help between 2001 and his death in 2007, and had claimed €2,262.15 in phone and computer expenses since 2005. Brian Cowen, meanwhile, has been paid €32,279 for secretarial assistance since leaving office in March, and has claimed €296.82 in phone expenses. He has also received computer equipment to the value of €1,440. In total, around €1.16m has been paid to former taoisigh under the scheme since its introduction. Ferris criticised the high amounts paid to the former heads of government, including those paid to John Bruton – whose expenses had been run up while he was the EU ambassador to the United States. “Is the taxpayer expected to foot the bill for Bertie to help write his grand speeches on what a great leader he was? It is a disgrace and must end. Ahern was still a TD until February 2011 – meaning he was entitled to employ a parliamentary assistant and a secretarial assist for his duties there – and would have received a TD’s salary worth around €98,000 until that time, on top of his pension as a former Taoisigh for over 10 years. Former taoisigh are allowed to employ two secretarial assistants for five years after they leave office, and one assistant thereafter. Assistants are not permitted to assist with political or constituency work. Email “Ahern claimed €377k in expenses since leaving office”. Feedback on “Ahern claimed €377k in expenses since leaving office”.